Forget about scarecrows. Some farmers are using laser beams to shoot thieving birds from their fields. 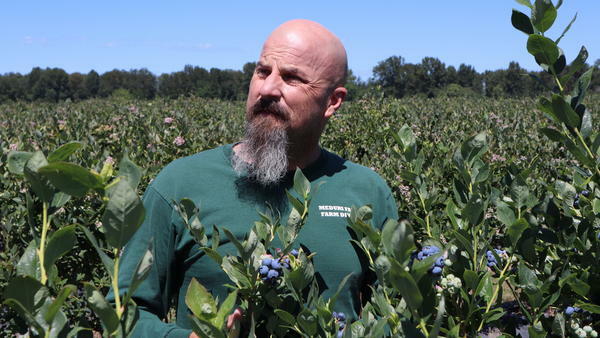 From the berry fields of Oregon, Tom Banse of the Northwest News Network brings us this report. TOM BANSE: Blueberry and cherry grower Justin Meduri previously hired a falconer to protect his fruit from ravenous starlings. But the falcons were expensive, temperamental and sometimes flew away. Then last year, he became one of the first farmers in the U.S. to install automated lasers. JUSTIN MEDURI: You're creating this kind of, like, laser light show at 4 in the morning that looks like a laser light show because you're crossing over these erratic patterns. Well, that's the time when birds come out. BANSE: The sweeping green laser beams emanate from what look like security cameras atop metal poles. By the time I visit, the lasers are in a daytime cycle. In broad sunlight, the human eye can only see green dots dancing across the berry-laden bushes. Meduri is thrilled with the results. BANSE: The clapping would have made them come out? MEDURI: Oh, yeah. They spook. (Clapping) So it's pretty nice. BANSE: A Netherlands-based company called Bird Control Group made the six lasers that Meduri first rented, then bought. Bird Control Group got started in Europe using lasers to shoo pesky birds away from industrial sites and airports. 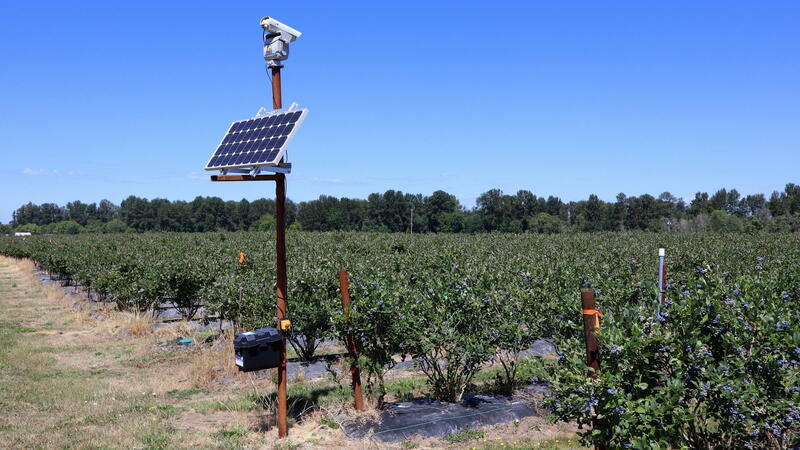 In the U.S., berry fields, orchards and vineyard applications appear to be the most promising. The company offers free laser safety training. And that's important because lasers can burn your eyes if you look into them. Bird Control Group says it programs its automated lasers to always shine the beam downward. It also recommends that fields be posted with signs to keep strangers out when lasers are in use. Researchers at Purdue University are leading an independent study into the risk of injury to the birds. Principal investigator Esteban Fernandez-Juricic says very little is known about whether lasers can fry the retinas in animal eyes. ESTEBAN FERNANDEZ-JURICIC: What we're trying to assess is whether different levels of energy output of these lasers and different levels of exposure time could cause any kind of retinal injury of the animal. And these retinal injuries could potentially be pretty serious. BANSE: Regardless, the director of North American business development for Bird Control Group is planning for rapid sales growth and expansion in sectors such as oil refineries, warehouses and dairy feedlots. Wayne Ackermann says one automated laser unit costs around 9 1/2 thousand dollars. He says some of his initial sales have come from farmers trying to appease neighbors. WAYNE ACKERMANN: One grower in eastern Washington was the first to bring it to my attention. He's a cherry grower. And he said he was having a combative relationship with one of his neighbors. BANSE: The lasers are friendlier than using poison or a 12-gauge shotgun as well. For NPR News, I'm Tom Banse near Jefferson, Oregon. (SOUNDBITE OF MIAO'S "OUR PATH TO..") Transcript provided by NPR, Copyright NPR.